Enterprises are considering various pathways for their transition to the cloud, and AWS in particular, which continues to be the dominant IaaS provider. When it comes to migrating data, businesses review their IT architecture, and often re-visit their database choices. Considering the number of database options for the cloud, including AWS’s own products, choosing the right DB option is not a trivial task. It never hurts to review your IT systems prior to a serious cloud migration. 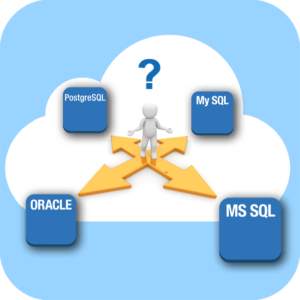 After all, if a more inexpensive database product can help reduce licensing fees, and is backed by a cloud provider with comprehensive SLAs, why not switch from Oracle or MS SQL Server to a cloud-based MySQL or similar service, for example? Or perhaps switch from MySQL to MariaDB Enterprise Server to enable fast delivery of high-performance applications and still materialize some savings? Most medium and large enterprises have a relatively complex database setup and require more advance data replication tools. While CFOs are not enthusiastic about the steep licensing fees of commercial databases, Oracle and MS SQL Server are still preferred by many software engineers and DBAs for their advanced features, reliability, and security. Usually, after a more thorough systems analysis, executives discover that CIOs made certain database choices for a reason, and the move to the cloud in many cases is more likely to re-enforce those choices, rather than eliminate them. While the public cloud infrastructure offers numerous benefits, it also requires enterprises to thread carefully into those uncharted areas, considering that many aspects of the cloud architecture are completely out of their control. The most cost-effective strategy usually evolves around maximizing efficiency, rather than downgrading database services. Commercial databases therefore are preferred by many DBAs, as they consider them as more secure, scalable and efficient database solutions. Perhaps a non-funded startup could prototype a new service using MySQL, but after the first round of financing a more robust database product should be considered. ⟵If Microsoft’s CosmosDB is top notch, will it enjoy adoption?